Contagion was recorded over the course of two or three weeks. I didn't sleep much during that time and I never left home, I was completely fixated on recording. I used a Tascam 424 4-track recorder. Effects were a combination of a little Zoom multi pedal, a boss distortion, and a dunlop crybaby for the occasional wah. I used a radio shack stereo eq also. Nearly all signals were dry since the only amp I had was a hummer. When you're contending with tape hiss on the 4-track you can't afford that hum. Also, generally speaking 4 tracks is not enough and bouncing them can only take you so far, so stereo feeds are a luxury you also can't usually afford. Drums were recorded on a 1970's era no-name drumset with actually 1970's era drum heads still on it. The same set was used for blue. I did polish the cymbols with some metal polish because I wanted them to be really bright and ringy. Vocals were generally put through a digitech vocalist where most of the time I added a double and an octave drop. I also added a third above sometimes. The overall function of the album was that it kept me focussed away from everything else for the first three weeks of what was to become the worst 3 years of my life. Although worse things had happened to me, there was something deliberate and truly unfair about what happened this time. I didn't take it very well. I'll leave your own good sense to fill in the rest. Contagion is really quite dark, sometimes angry, generally melancholy. If only the full force of my emotions were expressed I'm sure it would be blazing with pain and anguish, but alas I was more subdued and it's just melancholy. I did however meet a very talented vocalist during this time period and she performed two of the songs with me. Both songs were things I had been working on for awhile but had really wanted a woman's voice to represent the female perspective. I just didn't have a woman to sing them. It's takes both talent and guts to do that and Julie had both. Julie Van Horn did come in and not only sang, but sang very well. My favorite song on the album is #8 (inside of you). I think the full potential of Contagion is nearly realized on this song. 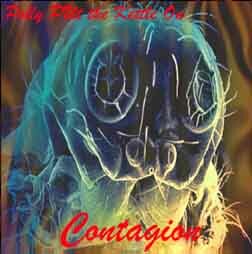 Contagion was released through MP3.com because it was an astoundingly cheap way to produce it. I never did much of anything to promote it (It was really done for my own reasons) and therefore it never really drew much attention. I do think it's a very artistic album and quite interesting from that angle, though not something most people would listen to on a daily basis unless they too were on the edge of oblivion. They could appreciate the perspective.